Ai tihnk wi awl deserbs a cawfee wiht a smorl shortbred awn teh sorsser !! Dat sowndz gud 2 me – Ai had 2 goe owt be4 breffuss dis mornin. Wull taek me awl dai 2 ged ober dat! oh nose, anni. but pb’s gift will help revive u, yes? Iz OK – had 2 goe fur a fastin bludd test – rooteen chekk-up fur diabeetuss. Happenz ebbri yeer! Ai had sumfin az sune az Ai got owt uv teh dokturs! an had sum breffus wen Ai got hoem, but enni diffruns 2 mai rooteen comfuzzles me! Ai haz 2 be sensiblol eben at Krissmuss! Ai hab ebbrifin goin – juss smawler porshunz! This am nawt teh onlee belly-esk lol MamaCat sended me… o, yu haz no ideeya!!!!! My braynium held tugevver wif elebenty layers uv dukkytaype…. o.O !! Try n tihnk ov garden slugs … taht thott shud keap yoo sayf faw a whylol, PK !! LOL Akshully, it won’t! Mai nawt-sekkund and bestest-kitteh-frend-ever tabbyboy Nermal used tu lie on hims back alla thyme. My mom called it hims “lazy slug” position!!! Him was teh awsum kitteh… an berry bery floofy. Shud find pics uv him, I know I has sum scanned…. fank u awl, Cali iz most floofy! i haz teh pleh pewnomya, iz pleh pleh, do nawt want! iz y i haz nawt bin awn. i reeds tho! hugs tu awl mai cheesepeeps frends! 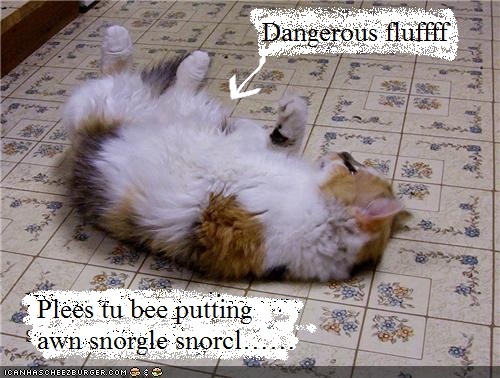 MamaCat, crawling back into bed…..
Oh noes. Beems coming yur way, plz tu be awl bedder soon! I hope Cali and Mia am taking good care of you! In Cheezland, the time is 18:57.